Scientists at Columbia University and Barnard College have found that the majority of the gamma rays outside of our galaxy are likely emitted by galaxy clusters and other massive structures. This may resolve a 30-year-old mystery as to the origin of the Universe's gamma-ray background. The finding may also provide new insight about how structure formed in the Universe, as well as the nature of magnetic fields in the intergalactic medium, of which little is currently known. 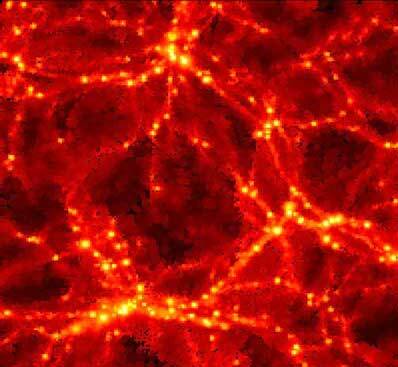 This computer simulation image shows large-scale structure in the universe, known as the cosmic web. Galaxies line filaments of matter like pearls on a string, and galaxy clusters arise where filaments meet. Credit: Uri Keshet et al., in "Gamma-Rays from Intergalactic Shocks"
Caleb Scharf of Columbia University and Reshmi Mukherjee of Barnard College publish this result in an upcoming issue of the Astrophysica Journal. The finding is based on the analysis of a nine-year record of gamma rays arriving at Earth from deep space, collected by NASA's Compton Gamma Ray Observatory throughout the 1990s. "This result not only resolves the question of where all these gamma rays are coming from, but provides a new probe of the gravity-driven picture of structure formation in the Universe," said Scharf. Gamma rays are the highest-energy form of light. In the Milky Way galaxy, gamma rays are largely produced when cosmic rays, atomic particles moving at near light speed, collide with interstellar gas. Black holes and neutron stars are also sources of gamma rays. Galaxy clusters are the largest gravitationally bound structures in the Universe. The clusters in this analysis contain up to several thousand Milky Way-size galaxies, and they are still accumulating material (gas and whole galaxies) from the surrounding space. The finding announced Tuesday supports a theory of gamma-ray production posed by Prof. Avi Loeb of Harvard University and Prof. Eli Waxman of the Weizmann Institute in Rehovot, Israel. Not unlike a black hole, the sheer mass of a cluster serves as a gravitational drain, drawing in matter at speeds of up to a thousand miles per second. Electrons in this flow are accelerated, with an additional boost from magnetic fields, to near light speed and collide with microwave light, the afterglow from the big bang known as the cosmic microwave background. These microwave light particles, or photons, are bumped up to the gamma-ray photon energy level. The gamma rays form a halo around the galaxy clusters. Other scientists, however, have suggested that the bulk of the gamma-ray background is produced not by this mechanism but by quasar-type galaxies, called blazars, each powered by a supermassive black hole. This background was discovered by NASA's second Small Astronomy Satellite (SAS-2) in the early 1970s. This computer simulation image shows what future gamma-ray observatories might detect, galaxy clusters aglow in a halo of gamma rays. The ground-based MAGIC (Major Atmospheric Gamma-ray Imaging Cherenkov) telescope and space-based GLAST (Gamma-ray Large Area Telescope) could be sensitive enough to detect gamma rays forming halos around clusters, created by electrons accelerated to nearly light speed and colliding with microwave light particles. Credit: Uri Keshet et al., in "Gamma-Rays from Intergalactic Shocks"
Scharf and Mukherjee's new research compared a catalog of 2,469 galaxy clusters with the Compton database. Using sophisticated statistical techniques, they showed that the sky surrounding the most massive clusters was systematically brighter in gamma rays than other regions. "The more massive the cluster (and greater the gravitational potential), the brighter the gamma-ray halo," said Mukherjee. "The enhancement observed was very similar to that predicted by the Loeb-Waxman theory." The result announced Tuesday also supports the theory of the cosmic web. Scientists say that matter in the Universe forms a cosmic web, in which galaxies are formed along filaments of ordinary matter and dark matter like pearls on a string. Clusters form at the intersection of these filaments. The electrons that fuel the gamma-ray production rush into clusters along these rivers or filaments of matter connecting galaxies and clusters. Thus, gamma rays serve as probes to the early structure-forming epoch of the Universe. 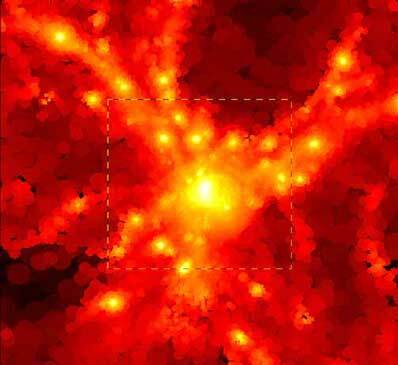 Gamma ray halos around clusters also provides a means to measure intergalactic magnetic fields. Two of the three variables to measure magnetic fields are known: the mass of galaxy clusters and the distribution of the microwave background. The third variable is electron efficiency, which can now be measured by virtue of gamma-ray production. The Gamma-ray Large Area Space Telescope (GLAST), scheduled for launch in 2006, should resolve gamma-ray haloes around galaxies with unprecedented clarity. GLAST could measure intergalactic magnetic fields and watch the formation of structure in the universe through its gamma-ray eyes, the scientists said.